A pioneering developer of green housing projects reimagines the metropolis as one big, compassionate community, engineered for efficiency and in tune with nature. By Jonathan F. P. Rose. Harper Wave, 2016. 480 pages. If that goal sounds lofty, consider that Rose earned his reputation as an urban-planning visionary through years of work on ambitious mixed-income housing and green projects. His firm was recently selected to lead an East Harlem housing project that will feature 655 apartments, with a significant percentage reserved for lower-income and senior residents. Other parts of it include a charter school, Mount Sinai wellness center, YMCA, and gardens. And as a “passive project,” it aims for high energy efficiency and a minimal environmental footprint. The principles that guide such intentional design can be found in The Well-Tempered City, alongside lessons gleaned from urban centers past and present. A recent example is Singapore’s biodiversity initiative, which promotes an array of plant and animal wildlife. From the need for wastewater reuse to studies linking obesity to a city’s “walkability,” Rose addresses critical challenges. 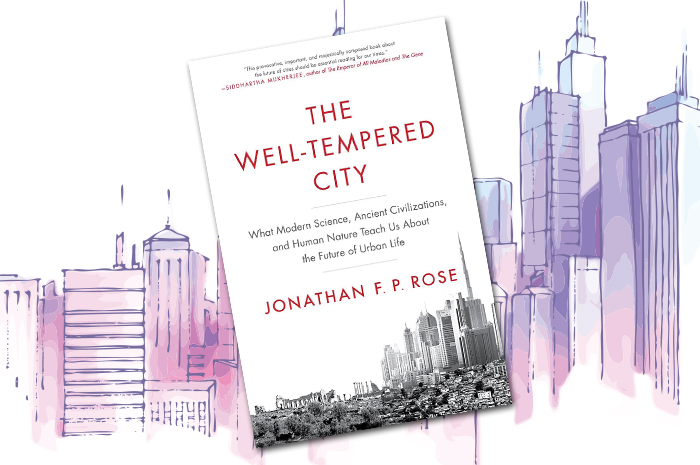 The book’s five parts present five qualities of a well-tempered city, according to Rose. These include coherence—a city’s organizing framework; circularity—its flow of resources; resilience—ability to withstand challenges; community—human culture, connections, and contentment; and compassion—support for members, ideally relieving suffering and achieving social unity. Part One begins with an ambitious historical study of human communities. From China’s Yangshao culture to the Maya El Mirador and the Greek grid-city Melitus, the author weighs each society’s successes, failures, and unifying principles, asking what they teach us. The Greek agora, or marketplace, made space for commercial and civil exchange, giving rise to democratic assemblies, for example. Tenth-century Islamic city planners recognized the social benefits of conjoining mosques to public baths, schools, and social service agencies; each worked toward coherence. While engineers with a historical bent will enjoy these sections, others may learn from recent efforts, such as New York City’s 2007 PlaNYC program, which tasked city agencies to integrate their separate domains into “a vision of an environmentally sustainable city.” They did so, in part, by sharing data as never before. One million newly planted trees were geocoded, for example, to measure effects ranging from storm-water absorption to air pollution reduction, temperature variation, and residents’ sense of well-being. Part Two, Circularity, examines issues of water, waste, and production and consumption, with emphasis on current and future crises cities face as a result of climate extremes. Here, too, Rose highlights innovations such as one in Las Vegas, which now pays residents to replace their lawns with xeriscaped gardens. In December 2016, the city declared itself powered 100 percent by renewable energy sources, thanks to its extensive solar panel program. Cursory treatment of certain topics strikes a discordant note in this otherwise fine book. The social mobility of 19th-century Pullman railroad porters is attributed to their exposure to the middle-class passengers they served, for instance, rather than their own considerable efforts to work, succeed, and educate their children. Bali, Indonesia’s irrigation system is hailed as a model of environmental cooperation, ignoring growing dissension on the island over water shortages and unchecked tourist development. Such lapses raise questions about information elsewhere in the book. But for the most part, The Well-Tempered City offers a thought-provoking consideration of modern metropolises’ wicked problems.